ate one of them days after I got them, while I was at a show. You know what text you don't want to receive while you're walking your XC course? "I'm afraid to tell you this, but I think Tucker just ate one of your new boots..."
My boss will tell you it's a PITA to have to order my county-embroidered apparel from the Osh Kosh B'Gosh Business Line. He's a funny guy. im going to need your help zipping up the right calf until they relax. haha. 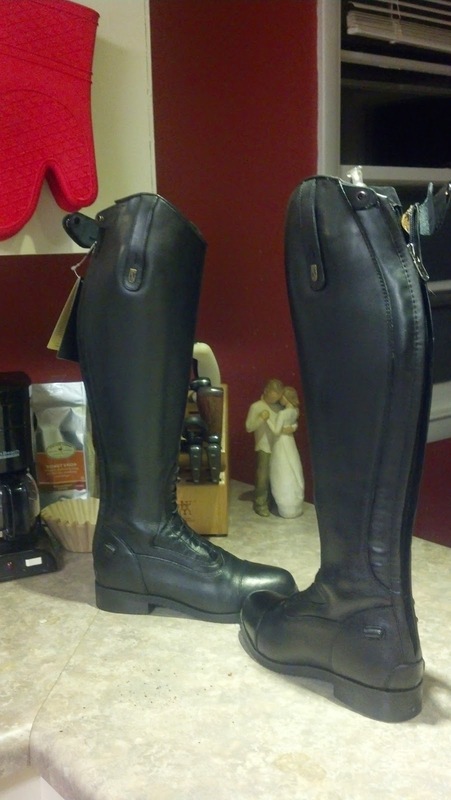 my half chaps taught me that my size in ariat's is "is the circulation to your feet cut off? good, that'll only last a few months." it gives you a nice, close fit through the calf. My calves are dramatically different sizes, weak side after the kick and all that. 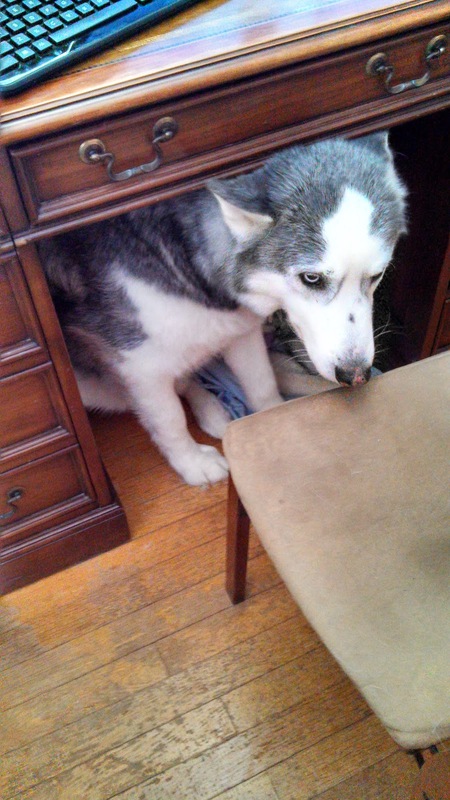 And I hid them in a place Tucker will never find them. Goodbye, saggin' baggin' Devon Aires, we had a nice nine-year run! Truly both baggin' and saggin'. YAY! I need to follow in your footsteps and hunt on Ebay for a new pair of tall boots!! Yes you do! 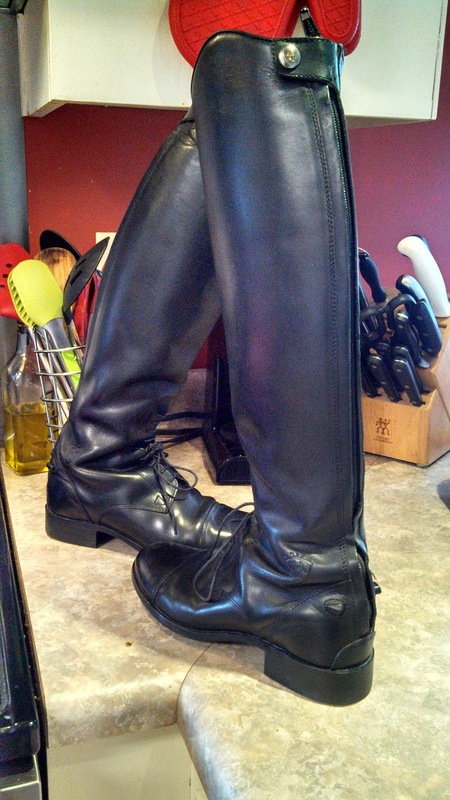 There are a few things that are incredibly easy to find good deals on, and tall boots are one of them. There's always someone that bought them, wore than a few times and then decided they don't fit and put them up for almost nothing. Gotta love ebay! 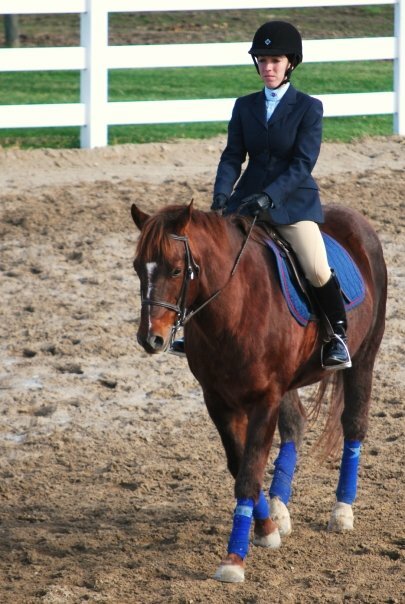 My showcoat and breeches are both from there for a ridiculous cheap cost! Love it. My coat is too, it's the best. There's really no reason to buy full price if you are patient. What a great deal round 2!!! Oh I am so nervous about that with both eBay and Facebook tack trader groups. I have only had good experiences so far, luckily. That is a deal! I bought tredsteps on TOTD. Waiting for them to arrive. How you find such steals is nuts! I was SO tempted by those, they were such a good deal! I'm glad you got them. I find them with eBay saved searches and patience, I have had that as a saved search for a year! I can make some pretty unflattering things work while waiting for a good deal. 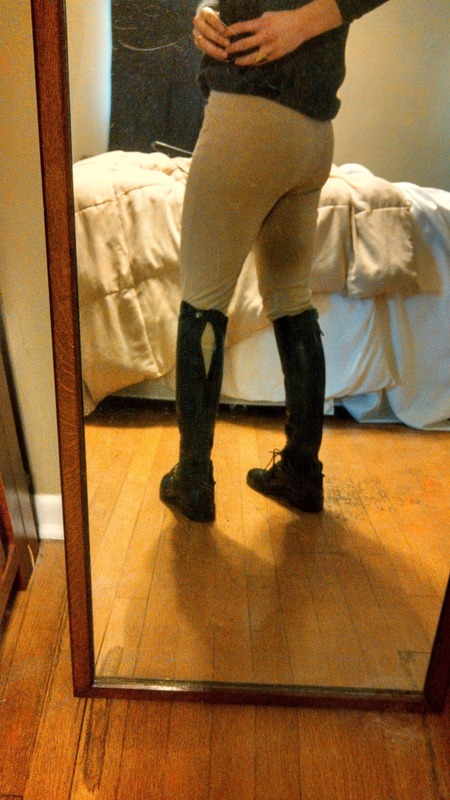 I still have my saggy breeches, good for wearing extra warm things underneath! Oh totally! Breeches are fine, boots are saggy, but yes, I definitely cannot wear these boots or my Ariat half chaps with any winter gear. 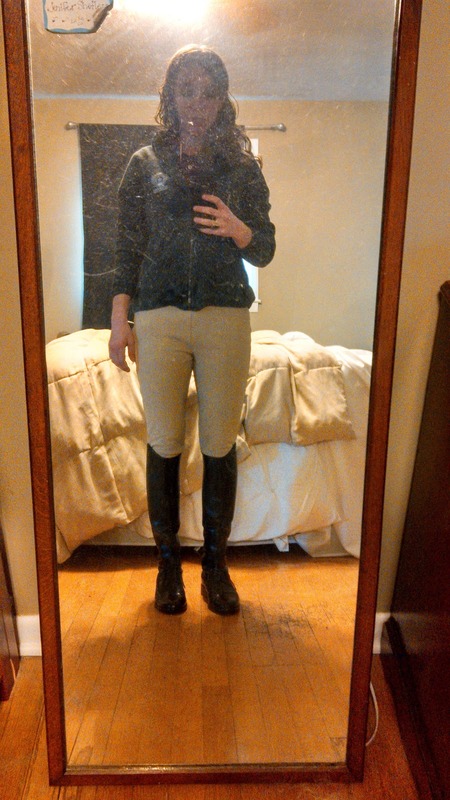 It's winter boots + winter breeches or bust. Just gotta pick your poison, I guess. Woohoo new boots!! Nice score. Very cool! I need to be more diligent about that. It does take diligence. I have way more time than money at this point in my life, though, so it's worth it. I am so envious of people who find great deals! I think I just don't have the patience. Yay for new boots at a good price!! Patience is definitely a big part of it. I am so jealous of your deal-finding ability. Yay for new boots! Hey, you helped me score my other deal! I would never have been looking for those. Great deal...sad about the first pair though! Oh yeah, I was so sad. It was hard to talk about for a long time. Being a personal shopper would be awesome! I think I've asked you this before and forgot to check the answer, but by any chance did you do any IHSA shows at St. Mary's of the Woods college? Those pictures look exactly like their arena.. Yes you did, and yes it is! I was a four year member and got my BS in Equine Studies. Cool! We were in your region (University of Illinois). I LOVED your big outdoor arena!